Nassau educational institution Spanish Fluency Academy for Youngsters announced its three Spanish for young learners programmes for 2019. Based on interactive, student-centred learning, the programmes are ideal for Spanish learners aged 4 - 12. 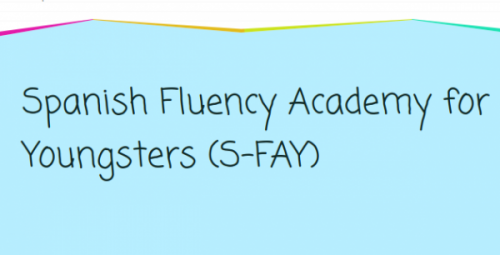 Spanish Fluency Academy for Youngsters, a Spanish language learning organisation based in Nassau, Bahamas, announced its upcoming courses for children aged 4 to 12. Starting in February 2019, the three courses are aimed at beginners, intermediate and advanced students, and include an interactive learning curriculum based on age-appropriate activities targeting all language skills. More information can be found at https://www.spanishfluencyacademyforyoungsters.com/courses.html. Learning a new language can be a fun process for many young learners, with modern educational resources allowing for the creation of a diversified curriculum adapted to a wide range of learning styles. Spanish Fluency Academy for Youngsters is currently accepting applications for its three Spanish for young learners courses starting in February 2019. The Chicos Group course is scheduled to start on February 5 and ideal for learners aged 4 to 7. Featuring a variety of interactive Spanish learning activities for beginners, the course is primarily targeted at young students without any previous Spanish learning experience. The Megusta Group for students aged 8 to 12 aims to provide intermediate Spanish learners with a series of activities that will help them deepen their language skills. Finally, the Grupo Veloz is a fast-tracked learning group for advanced students looking to develop near-native Spanish fluency. The registration deadline is January 15 with limited spaces available. The recent announcement is part of the Academy’s commitment to providing student-centred Spanish learning programmes for young learners. The Spanish Language Games is an annual Spanish language competition for students enrolled in the Academy.